One would think that the hype of drummer Mike Portnoy leaving Dream Theater would have subsided by now. But on the eve of the release of their eleventh album, A Dramatic Turn of Events, remaining members are still taking swipes at him. It's a shame really as the title of this album declares this simple ironic reality. The departure of a founding member after better than 25 years of music is always a difficult and emotional matter. But it's no excuse for emotional side swipes. Thankfully, this 'dramatic turn' did not affect Dream Theater's music. A Dramatic Turn of Events is pure and classic Dream Theater. 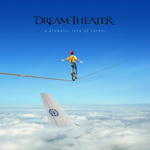 A Dramatic Turn of Events is thoroughly enjoyable: melodic, symphonic, technical, and entertaining Dream Theater. The classic DT begins at the start with On the Backs of Angels and, not surprisingly, new drummer Mike Mangini (Annihilator, Extreme, James LaBrie, Steve Vai, et al) has some prominence. The friendly and accessible (akin to Pull Me Under) Dream Theater comes on the highly melodic and catchy Build Me Up, Break Me Down, proving again that prog is not the realm of musical geeks. Their symphonic, lighter, side arises on the introspective and melancholic This Is The Life. Later, lightness meets minimalism on Far From Heaven which offers vocals over piano. And if there is any question about James LaBrie's exceptional talent, then you are reminded again on these tracks. As for the rest of A Dramatic Turn of Events, classic Dream Theater best describes the songs. There's the odd intro and outro to Bridges in the Sky that leads to an arrangement both heavy and epic. Simply 'progish' may describe Outcry and Breaking All Illusions. The former begins lightly with piano, but quickly soars to massive riffage. In the middle, the bass becomes definitive, and the solos that follow, thrill. The latter, Breaking All Illusions, confirms (again) that DT has lost nothing of their creativity and trickery. That mix of tempos, the lilting piano woven within, and those rambunctious solos exist only to confound and entertain. This is Dream Theater. Passing over all the controversy, A Dramatic Turn of Events finds Dream Theater in fine and classic form; they haven't skipped a beat, and why should they. Sure Mike Portnoy should be missed, but the best band rumbles on. Strongly recommended. Passing over all the controversy, A Dramatic Turn of Events finds Dream Theater in fine and classic form; they haven't skipped a beat, and why should they. Strongly recommended.